50 Amp Female to 30 Amp Male Adapter. The solid ground pin provides improved ground connection for safety, while the molded in finger grips make it easier to disconnect after use. Made of high impact, heat resistant plastic, and heavy-duty highly conductive metal parts. This greatly improves heat dissipation and conductivity. When I connect my Progressive industries EMS-PT50C 50 amp protector, the weight of the PT50 c pulls this adapter plug out of the receptacle. The receptacle was professional installed by a qualified person at my home, so I know it is not the fault of the receptacle. 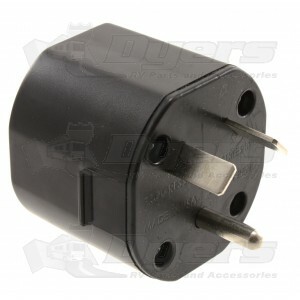 Progressive Industries recommends using this plug rather than a pigtail with their surge protectors. Have had other pig tails get to hot and melt so went with recommendation and am very pleased with decision. Adapter came on the date the company said it would arrive so pleased with service.